Hours: 8:00 am.- 5:00 pm. 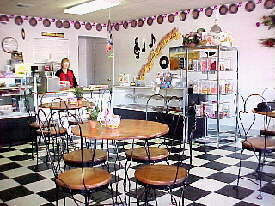 The CFL Gourmet Coffee shop offers fresh ground coffee, cappuccino and espresso. The lunch menu includes: bagels, croissant sandwiches & soup, gourmet chocolates and a comfortable dining environment filled with the music and novelty of the 50's era. Gift baskets and novelty items are available. Too Delicous prides itself not on only a high quality meal and beverage, but on providing an invaluable service to the local community in the form of paid vocational training for individuals with developmental disabilities. Through the CFL vocational training programs, residents of the CFL community have proven to establish themselves as valuable assets to the work force. You can help encourage this positive employment placement practice by hiring a trained CFL worker to work for you. Customer Service: trainees are taught to interact with the public in a professional manner. Cash Register: assisting in processing meal tickets and change. Coffee Grinder: operating a coffee grinding machine. Food Preparation: preparing food in a clean and safe environment. Stock and Displays: stocking and restocking of inventory; pricing and displaying of goods. Janitorial: trainees learn the proper way to clean and sanitize a food preparation environment. Hours: 9:00 am.- 4:00 pm. The CFL Thrift Shop sells products donated by the public, creating a virtual treasure of books, clothing, baby items as well as infant car seats, houseware, paintings and home decor. The Thrift Shop is always seeking to increase its product line through your donations. Please call the Thrift Shop for drop off times and locations for your tax-deductible donations. Customer Service: trainees are taught to interact with the public in a professional manner, by greeting customers and offering assistance. Stock and Displays: stocking and restocking of inventory; pricing, sorting and displaying of goods. Strands of mylar are swirled into mohair using our special process. Now crafters, handspinners, and decorators can create lovely looks never before possible with the old fiberglass angel hair. The more our angel hair is fluffed the prettier it becomes. Available in one ounce bags in a fabulous array of colors. For the "average" Christmas tree it takes two bags. Each bag is $5.00, which includes shipping and handling. 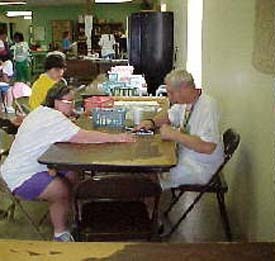 The CFL Sheltered Workshop offers low cost and extremely competitive manufacturing and assembly work. Local manufacturers subcontract with the CFL Workshop to perform duties that are repetitive in nature, and that are more costly when performed in-house.